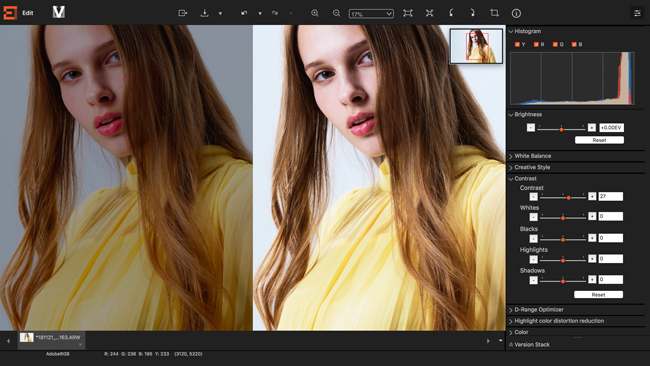 A software suite for greater efficiency and image quality in shooting and creative work. Imaging Edge (Remote/Viewer/Edit) 1.4.00 has been released. Imaging Edge (Remote/Viewer/Edit) 1.3.01 has been released. * Those who use the product that released main system software updates after October 10, 2018 or those that will be released in the future will need this Imaging Edge (Remote / Viewer / Edit) 1.3.01 or later. Imaging Edge (Remote/Viewer/Edit) 1.3.00 has been released. Imaging Edge (Remote/Viewer/Edit) 1.2.00 has been released. Capture interval 0.5 seconds has been added to the Pixel Shift Multi Shooting settings. * The model (ILCE-7RM3) needs a system software update (to Ver. 1.10 or later). Imaging Edge (Remote/Viewer/Edit) 1.1.00 has been released. Approx. 10% faster data transfer speed for remote shooting from a PC. Approx. 65% ​​improvement in response speed for adjustment of RAW images. Improved reliability when using a network drive. Improved operability, orientation detection (vertical/horizontal) during remote shooting,Exposure time specification for bulb shooting, enhanced image filtering function, etc. *1 The transfer speed has been measured with multiple images using α7R III, SuperSpeed USB (USB 3.1 Gen 1), and Uncompressed RAW (L: 7952 x 5304)＋JPEG Extra fine. Imaging Edge (Remote/Viewer/Edit) 1.0.00 has been released.